Hillsborough County, New Hampshire Hillsborough County, New Hampshire U-Pick farms: Find a pick your own farm near you in Hillsborough County, New Hampshire for fruit, vegetables, pumpkins, organic foods,local produce and more! Looking for a local, pick-your-own farm in Hillsborough County, New Hampshire? Scroll down this page and you will see the U-Pick farms in Hillsborough County, New Hampshire, sorted by county. Those that offer organic or sustainably grown produce are identified by the words "organic" and/or "sustainable" in Green, next to their name (see "What does Organic mean?"). The U-pick crops they offer follow the name of the farm. To search the page for a specific crop, use Ctrl-F (or on an ipad or Mac, use their "search on this page" function) If they have a website, the name will be in blue and underlined; click on it and it will open their website. If you find anything outdated or inaccurate, see the customer and farmer menus (as appropriate) at the top menu bar to submit updates and corrections and help me keep each current! 206 Old Turnpike Road, Route 124. Mason, NH 03048. Phone: 603-878-0542 Email: [email protected]. 450 Fitchburg Rd, Mason, NH 03048. Phone: 603-878-4022. Alternate Phone: 603 878 2351. Fax: 603 878 2817. Open: Daily from 8am to 6pm; June 10 to July 6th. Directions: Intersection of routes 31 and 124 in Mason, NH. Click here for a map and directions. Payment: Cash, Check, Visa/MasterCard. Farm stand is open daily from 10am to 7pm; from June 10th to September 30th. A family experience that should not be missed! We have 10 acres of "pick your own" strawberries and an outstanding view. Pre-picked berries are also available. We are located at the junction of Routes 31 and 124 in Mason, NH (50 miles from Boston, 30 miles from Manchester, and 35 miles from Worcester).We feature a full line of meats, vegetables, sweet corn, fruit and cut flowers grown on our farm. We begin with strawberries in June and by July 15 have a full complement of fresh picked vegetables. 234 Parker Road, Goffstown, NH 03045. Phone: 603-497-8138 Fax: 497-8138. Open: July-August. 38 Broad Street, Hollis, NH 03049. Phone: 603-465-2240/2241/2242 Fax: 465-3754 Email: [email protected]. Open: in season . Strawberries-June; blueberries-July-August; raspberries-July-September; apples-September-October; pumpkins-September-October; cut flowers. Special Events: Domestic animals & birds-pens; seasonal festivals; hayrides-fall season, weekends afternoons; Half Marathon- October; School groups-scheduled only. 3 Old Concord Road, old Route 202, Antrim, NH 03440. Phone: 603-588-2857 Fax: 588-3513 Email: [email protected]. Open: mid-July-1st week of September. 9 Peaslee Road, Merrimack, NH 03054. Phone: 603-881-8864 Fax: 881-9905 Email: [email protected]. Open: 10am-5pm, weekdays; 9 am to 6pm, weekends; Labor Day-Thanksgiving. 172 Nartoff Road, Hollis, NH 03049. Phone: 603-882-0072. Email: [email protected]. Open: 7 Days/week 8:00 am to Sunset. Click here for current open hours, days and dates. Picking updates: Click here for picking updates. Directions: Please visit our webpage: Click here for a map and directions. The Dark Crop is open Fridays and Saturday evenings starting October 7th - October 29th; Also open Sunday, October 30th; Hours of operation are 7:00 pm to 10:00 pm. Payment: Cash, Check. Click here for our Facebook page. We provide the flashlight; all you have to do is make it to the end of the maze. 157 Charles Bancroft Highway Route 3A, Litchfield, NH 03052. Phone: 603-867-5926. Email: [email protected]. Open: The season is typically July and August; 7 days a week from 7 am until 2 pm at the blueberry farms as long as it is not raining; Please call first if we are getting a steady rain. Directions: Click here for a map and directions. PYO blueberries: 157 Charles Bancroft Highway (Route 3A), Litchfield is open around the beginning of July and closes around the beginning of September. Payment: Cash, only. We supply all you need to pick and carry home and you enjoy the picking. We sell by the pound. 338 Curtis Farm Road, Wilton, NH 03086. 31 Hillside Terrace, Merrimack, NH 03054. Phone: 603-429-0808. Email: [email protected]. Open: from July to Sept for PYO; Call first for picking conditions and for what is available; We won't have blackberries, blueberries, raspberries (red), . in 2016 due to the weather; we hope to have them in 2017. Directions: Click here for a map and directions. Payment: Cash, Check. Also, we have Honey in many sizes including jars, comb honey (when available), and skin creme made from our beeswax all year. (UPDATED: July 03, 2016) . 65 Broad Street (Route 130), Hollis, NH 03049. Phone: 603-465-7079. according to their website: Hours: 7:00am - 7:30pm. According to their website: Pick Your Own Strawberries (mid June- mid July) Pick Your Own Blueberries (July-August) Pick Your Own Raspberries (July-August) Pick Your Own Apples (late August -October) Pick Your Own Pumpkins (September-October) Corn Maze (September-October) Annual Pumpkin lighting (Halloween Night & following Night). Come carve with us starting three days before Halloween! Comments from a visitor on September 10, 2008: "it's wonderful!" North River Road, Milford, NH 03055. Phone: 603-673-3544. Open: mid-August-late-October. Apples: Paula Reds, McIntosh, Cortland, Gala, Mutsu, Jonagold & Roxbury Russet. Special Events: Visit our orchard farmstand. Route 3A, Litchfield, NH 03052. Phone: 603-424-9268 Fax: 424-9268. Open: 9 am to 5pm. 39 Merril Road, Hillsboro, NH 03444. Phone: 603-464-3706. Email: [email protected]. Open: 7am to 7 pm, 7 days a week. Directions: Click here for a map and directions. 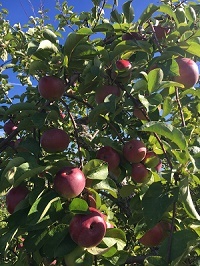 Picking starts mid July; Call first to verify availability before coming, approximately July 10 to October 31, closed for ripening occasionally during season. Payment: Cash, only. 5 Duncan Road, Hancock, NH 03449. Phone: 603-525-4912. Open: 10am-6pm, September & October. South of Route 101 on Route 123, Peterborough, NH 03458. Phone: 603-924-7774. Fax: 924-6757 Email: [email protected]. Open: 9 am to 6pm, daily, May 18-October 14. Herbs: all season; flowers: July 1-frost; raspberries: July 1-August 1; blueberries: August 1-September 1. Visit us in July for pick-your-own raspberries and in both July and August for pick-your-own blueberries. They're also available for purchase at our farmstand. Our berry plants are separated by grassy paths so it's easy for you to find and gather the ripest fruit. Stop at our farmstand to learn how and when to pick; for example, the best picking time is when the fruit is free from dew. We provide pressed cardboard containers in pint and quart sizes. All of our berries are organically grown and kept pest-free with natural controls and products. We challenge you to drive home from New Hampshire without eating them all! 265 Turnpike Road, New Ipswich, NH 03071. Phone: 603-878-2351. Fax: 603 878 2817. Email: [email protected]. Open: Wednesday, Friday, Saturday, and Sunday from 8am to 6 pm; July 20th to August 31st. Directions: Click here for a map and directions. Payment: Cash, Check. 70 Coburn Avenue, Nashua, NH 03063. Phone: 603-595-4560. Email: [email protected]. Open: Sunday to Saturday, from 9am to 6pm September1 to October 31. Directions: From route 3 north or south take exit 6 west. Go 1 mile to roundabout,take first right on to Coburn Avenue. The farm is quater mile on the left. Click here for a map and directions. Payment: Cash, Check, Debit cards, Visa/MasterCard, Discover. Fall Festival on Columbus Day weekend, that Sunday. This festival benifits the Salvation Army in Nashua NH. Games, PYO apples, hay rides, face painting, scarecrow making, music, and food. 1 Main Street, Antrim, NH 03440. Phone: 603-588-2020. Email us at: [email protected]. Directions: Take 202 coming north or south thru Antrim, you cannot miss us. Click here for a map and directions. Crops are usually available in June, October. Open: daily 9-6 stand hours ice cream hours 12-8 Sunday thru Thursday, Friday and Saturday 12-9 We are open from April to November 9 to 6 daily. We also offer bedding plants, perennials, and pre-picked strawberries, raspberries, tomatoes, cukes, lettuce, melons, plums, peas, eggplant, peppers, squashes (both summer and winter), apples, peaches, corn, pumpkins, homemade ice cream, lots of made in New Hampshire products such as maple syrup, coffee, and pottery. Payment: Cash, Check, Visa/MasterCard, Discover. We have an ice cream stans=d with Annabelle's, which is 100% Natural. There is no additives or preservatives. It is a super premium ice cream which means its fat content is above 16%. Many of you might say wow that's a lot, but that is how it gets its GREAT taste. Along with Annabelle's Ice Cream, we also sell some old favorites that are not all natural but still taste oh so good. We added hot dog specials a few years back, using only all natural casing hot dogs. We only like the best tasting dogs and would not give our customers any less. As always we offer ice cream cones, sundaes (of all kinds and combinations), smoothies, hot dog specials, fresh squeezed lemonade, and frappes.